The superhero hit comes home on a 4K tide of awesomeness. When I went to see Aquaman as it opened in theaters late last year, I’ll admit I wasn’t expecting much given DC Comics and Warner Bros. track record with their films. I guess that’s what made it all the more amazing when I came out loving it as me and the audience had a great time watching it. Now the movie flows to home shores with the 4K HDR release of Aquaman. Fans and those who enjoy superhero films are sure to get swept up in the tide of action and fun. Be sure to check out my review for the theatrical release that has the plot details and such while I discuss the 4K Blu-ray release and its special features. I have to say it’s pretty amazing how 4K releases look and sound exactly as detailed and crisp as they do in the theaters, especially if you happen to see the movie in IMAX. It’s like you’re basically getting a master copy of the film when you pick up the 4K HDR Blu-ray, as everything comes through perfectly. Watching it over again took me back to the feels and fun I had at the movies, as everything came flooding back (pun intended). I’ll admit the movie and some of its characters aren’t perfect, but this is as close as it gets for DC and Warner Bros until their next release, Shazam comes along. There’s also quite a few special features to dive into once the film is done. 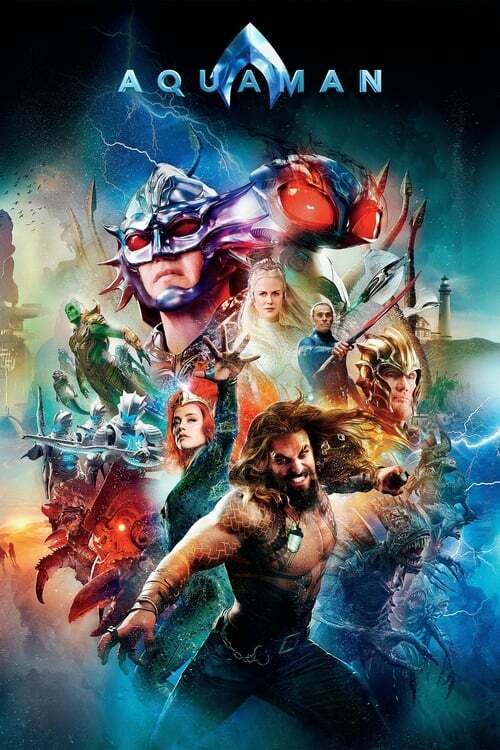 “Going Deep into the World of Aquaman” is a nice behind the scenes piece that goes into some of the production details with interviews with the cast and crew giving their take on the making of the film. “Becoming Aquaman” has Jason Momoa talking about becoming the iconic character, the training he went through for the role, and more. “James Wan: World Builder” features the famed director discussing how he worked with the production team to create the awesome underwater world for the movie, how the special effects came to life, and such. “The Dark Depths of Black Manta” is an interview with actor Yahya Abdul-Mateen II on my favorite character in the film, the villain Black Manta, and what he brought to it in his performance. “Heroines of Atlantis” has stars Amber Heard and Nicole Kidman discussing their characters and how they’re important to the story, “Villainous Training” showcases Patrick Wilson and Yahya Abdul-Mateen II talk about how much physical training they had to do just to try and keep up with Jason Momoa. “Kingdoms of the Seven Seas” stars Dolph Lundgren as he gives us a tour of the seven undersea territories from the film while also teasing at some future sequel stuff. There’s also more dealing with the awesome special effects for the undersea creatures, the Atlantean weapons and technology, and a few others to round out the extras. Those looking for the next big action piece for their 4K movie collection will want to dive into the amazing Aquaman 4K UHD Blu-ray. With a flawed but incredibly fun film with vivid 4K visuals, HDR color, and Dolby Atmos sound, and some pretty cool special features, you’ll want to take the plunge with family and friends.